Every year I make a couple of bottles of this Blackberry Brandy and it is absolutely scrumptious on a cold winter’s evening (or mixed with iced lemonade on hot summer’s evening if you have any left by then). Put roughly equal quantities of the sugar and black berries into the jars, pour in 250 ml each of vodka and brandy, screw on the lid tightly and shake hard to mix up ingredients. Keep in the dark spot and remember to shake once a week for ten weeks. Strain through a sieve lined with muslin, and pour into the bottles (then label) you want it to be in — 500 ml bottles are quite good and I save anything I like the look of during the year. Remember you will need to seal it so screw tops ones are best. 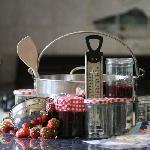 Would really like to try this recipe of Blackberry Brandy but am slightly confused, what would the weight of 3 cups be or should I just use a normal breakfast cup to measure? Many thanks and what a great site this is. It’s not my recipe but it does say quantities need not be exact. 3 standard tea cups should be about right. 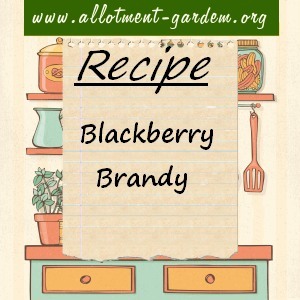 I would like to make some Blackberry Brandy to give as Christmas presents. Am I too late – Nov 2nd today so I don’t have ten weeks! 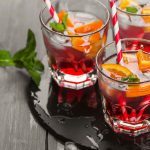 I have chosen your Blackberry Brandy recipe to make because it looks to be the best and simplest from my search. Now I just need to go pick those blackberries. I have visited this site and used many of the recipes, brilliant! I’m about to embark on the Blackberry brandy…..so I can give as a small christmas gift. Im going to make some pretty labels. thanks for the site!! How strong is this drink? Sound wonderful.